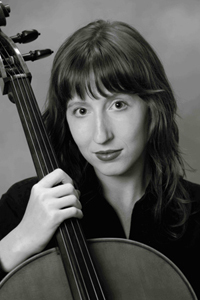 Cellist Anne Berry is active both as a performer and teacher. Last May, Anne graduated with her Doctorate of Musical Arts from the Hartt School of Music. Anne is currently a faculty member at the Greater Hartford Academy of the Arts, and Three Rivers Community College. She is co-founder of the Hartford-based chamber music ensemble, the Living Room Players, which is in it’s third season and performs throughout the greater Hartford region. In Winter of 2009, Anne performed with the Ganesh String Quartet tour in France. In 2007, she served as cellist of the piano trio in residence at the University of North Carolina at Greensboro. She was also the grand prize recipient of the Duquesne University Women’s Advisory Board competition in 2003. Anne holds degrees from the Hartt School of Music, the San Francisco Conservatory of Music, Duquesne University, and the University of North Carolina School of the Arts.